Those of you who have Scottish ancestry may be interested to know that two more Scottish related databases have been added to the Ancestry.com collection. 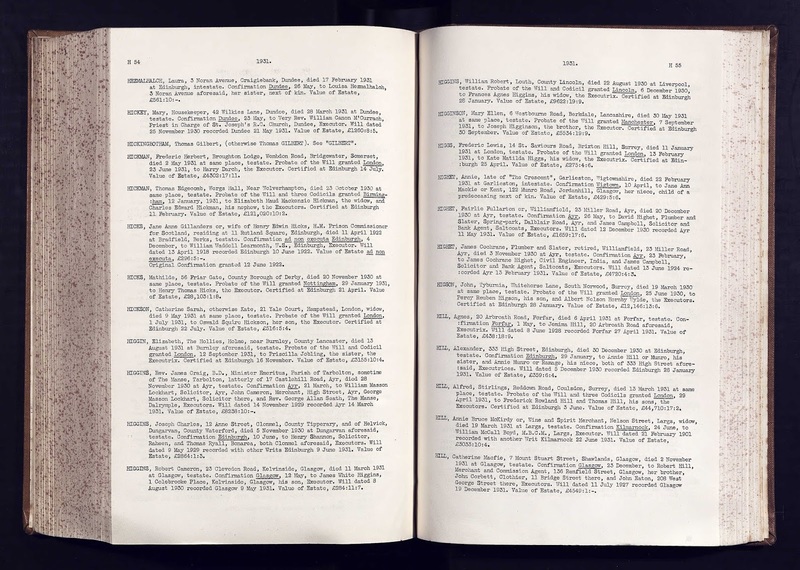 These are - Scotland, National Probate Index (Calendar of Confirmations and Inventories) 1876-1936 and Perth and Kinross, Scotland, Electoral Registers 1832-1961. This is the first time that the confirmations and inventories have been made available other than on the Scotlands People website; however, you will need to visit Scotlands People website for wills prior to 1876. So, what can you expect to find on these databases? Calendar of Confirmations and Inventories – this can be browsed by year but if looking for a particular person/family use the search box. As with other searches you can search using a surname only, Christian (first) name only and the wild cards are also available. You do not need to enter a date of death, place of death etc but may do so if you want to reduce your number of “hits” (start with less detail and add to it as necessary). The results page will give you a list of names of deceased, death date and place and confirmation date. By clicking "View Record" you will get the place of Confirmation. The best part is when you click on "View Images", this gives you the following - name of deceased, occupation (mainly only men), address, date and place of death, whether testate or intestate (will or not), when and where Confirmation granted, names and addresses of executors, date of will and any codicils, date recorded in Court Books (if applicable) and lastly value of the estate. If you want a copy of the confirmation, inventory and/or will you will need to use the Scotlands People website. You register (free) and then go to the index on their site and click on the button attached to your entry of interest. A small fee is charged and you will receive a digitised copy of the documents. Apart from the will, inventories can be very informative some more detailed than others but you will get some idea of household goods, bank accounts, debtors/creditors etc. Do check these indexes for Scots dying outside of Scotland as well as if they had property in Scotland then probate would have also been granted in Scotland. There is a guide to Scottish wills on both the Scotlands People and National Records of Scotland websites – these give detailed explanations of the process of probate. Perth and Kinross, Scotland, Electoral Registers 1832-1961 - this collection can be searched by county (Kinross, Perth or Perth and Kinross). Otherwise use the search box as described above. Electoral rolls from 1920 onwards appear to only give the name of the person, address and electoral district. However, the earlier rolls give the following – electorate, name of voter, address, occupation, qualification to vote e.g. occupant of house, proprietor of house and shop etc, where property is situated. Having these available will be a great advantage for research in Scotland especially if you are unable to visit Scotland yourself.